Why? We previously concluded that fresh lemon juice beats the pants off of the ubiquitous bottled ReaLemon when used in mixed drinks. I later ran across this nice post by K. Liu about the impact of aging citrus juice on its taste. His conclusion was that lemon juice that has been aged 4-10 hours tastes better than freshly pressed. Why sidecars? Well, they are slightly Dr. Who themed, we like them (exhibits A & B), and we would like to know if extra steps make a noticeable difference in finished products. I don’t know about the readership of this blog, but our core taste testers generally don’t go around drinking straight lemon juice (although, when we convinced Taste Tester F to do so for science, he proclaimed “you guys are assholes”). Three sets of lemons, all of which were juiced eventually. Procedure: To minimize the variation between individual fruits, we used three lemons for each category: fresh pressed, pressed from rolled lemons that sat for 5 hours, and juice that had been aged 5 hours. To examine if the enzymatic bittering process requires oxygen, we thoroughly rolled 3 lemons and let them rest for 5 hours. The idea was that many enzymatic processes occur when cell walls are broken down. By physically rolling the fruit, internal structures will be broken without introducing oxygen, which would occur when the fruit is cut & pressed. The double-blind method utilizing a series of wine charms was used, as described here. 1 aged juice bright citrus notes on nose and palate, seems well balanced and brandy sweetness seems more prominent. 2 fresh juice more strongly citrusy nose, maybe a slight metallic flavor? All three testers preferred the sidecar made with the aged lemon juice. Taste tester A disagreed with F and P, and initially ranked the fresh juice as third due to a slightly mellower flavor combined with a slightly metallic aftertaste. 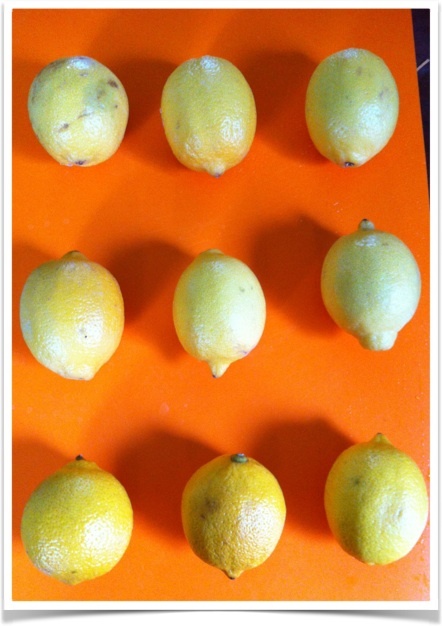 When tasting the lemon juices by themselves, there was strong agreement with the ranking as shown above. The juice from the rolled lemons was distinctly odd and more bitter than the other two juices. This may have been the result of aggressive rolling introducing more bitter compounds from the seeds or internal skin (similarly to how the mechanized juicer noted here; didn’t fare well against fresh pressed or aged juices). While the differences were noticeable, all of these drinks were tasty. There is some appeal to being able to “safely” juice lemons ahead of time. Background Science: As mentioned in the blog posts by K. Liu, enzymatic bittering (specifically the formation of limonin) is suspected to be the culprit behind the changes in flavor after juicing, instead of “simple” oxidation. While limonin is not present in lemons (refs 2 & 3), nomilin (which is also a limonoid phytochemical) is present. Apparently in most citrus species nomilin + enzymes –> obacunone –> limonin (source). While both nomilin and limonin are bitter, limonin can be detected at concentrations as low as 0.5 ppm by some people, the two seem to have different qualities of bitterness (with nomilin “being more astringent, metallic and lingering“), and the presence of both compounds can enhance the overall bitter effect. While bitter is bad in fruit juices (like orange juice), it can take the edge off the acidic aspects of fresh lemon juice, making for a better drink experience. Future Questions: As it was uncertain what effect oxygen has on the aging process due to the possible extra bitter components from broken seeds/skin, perhaps trying again with a less aggressive roll would be worthwhile. Additionally how does the microwave technique (see pt. 2 here) impact flavor with/without aging? Arnold, D. “Fresh Lime Juice: WTF?” Cooking Issues. Oct 1, 2010. Interesting and fun. Thanks for the info.